Very nice Reproduction Cotton fabric. Shows little pumpkins in a nice orange (not bright) with little black seeds scattered around on a beige background. Apron fabric is a cotton ecru with a darker ecru print. 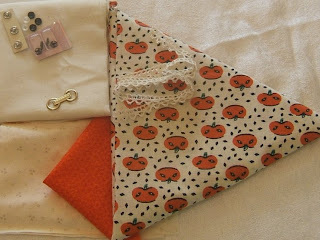 A nice, bright square of orange cotton is added for a hanky for a splash of color to complete the outfit! Muslin collar. 5 Snaps, 5 buttons, cute belt buckle and cotton lace for apron.